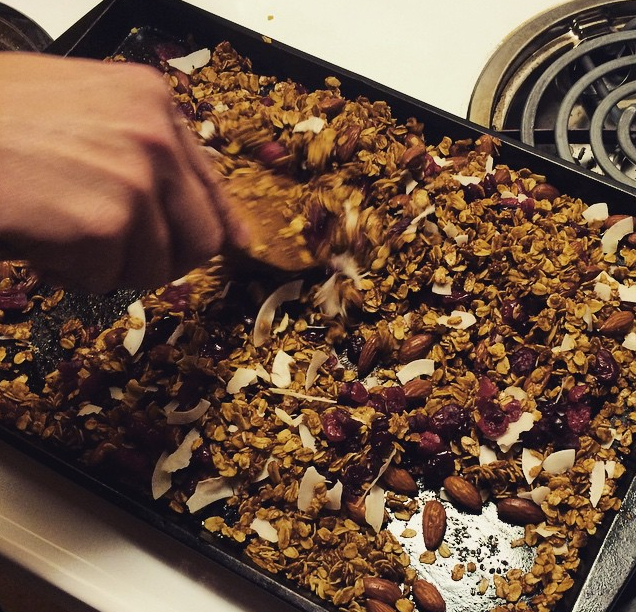 Every Sunday for the last month or so, I've been making a big batch of granola to last me the rest of the week. It saves money, helps keep me satiated during long hours on the farm, and makes for a lovely gift to share with friends. And it is damn good. I've finally settled on a highly unscientific recipe for granola that's a savory, nutty, chocolatey mix of all good things (and it comes together in forty minutes). It's a flexible recipe that you can tailor to your own tastes. Hope you enjoy! Preheat oven to 350. As oven warms, thoroughly mix oats, chips, nuts, peanut butter, olive oil, and salt together in a large bowl. Make sure that the olive oil and peanut butter in particular are evenly distributed. Spread mixture onto sheet tray and bake for thirty to thirty five minutes or until lightly browned. Stir every 15 minutes. Let cool five to ten minutes, add cranberries, and then dig in! MEET OUR NEW HEALTH AND WELLNESS COLUMNIST KIMORA!